Bison head coach Jon Rempel talks to his players during a timeout in the Canada West semifinal against the Alberta Pandas on Feb. 25 at the Wayne Fleming Arena in Winnipeg. 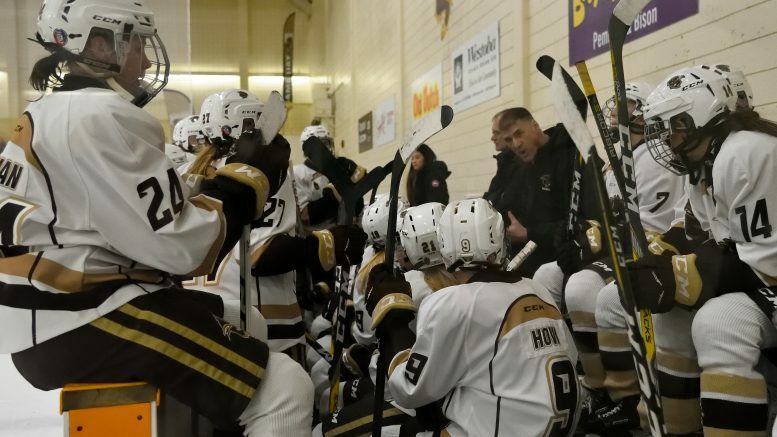 In his fourteenth season behind the University of Manitoba Bisons bench, head coach Jon Rempel has been named U SPORTS Women’s Hockey Coach of the Year. This season Rempel had his squad sit at a No. 1 national ranking, a Canada West championship, and a berth at nationals. He and the team will now look towards checking off the fourth box, a U SPORTS National Championship banner. “I think the year went pretty much according to how I could’ve scripted it,” Rempel said. Rempel’s superb scouting and recruiting skills were on full display this season, ranging from veterans to rookies. Manitoba was 14-2-1-0 in one goal games, which led the Canada West, something Rempel noted was an advantage heading to London. “This team played the right way this year,” Rempel said. This is Rempel’s sixth time at nationals behind the Bisons bench – qualifying in 2005, 2007, 2008, 2009, and 2011 – but he feels that this trip stands out from the ones before. The Bisons have never finished better than third at nationals, taking home bronze in 2005, 2007, and 2008. In 2009 they finished fourth, and came in sixth in 2011. “I don’t see this team in that same type of vein,” Rempel said. At the same U SPORTS Banquet where Rempel won his award, rookie netminder Lauren Taraschuk was named to the U SPORTS All-Rookie team. She and goalie-partner Rachel Dyck came up huge for their team, both acting as main catalysts for the team’s success. “Big credit to Rachel for really sort of taking Lauren under her wing,” Rempel said. Dyck stumbled out of the gate early, giving up 14 goals in her first four starts – for a 2-2 record – and was pulled in her fifth start, after giving up two goals on eight shots against Mount Royal. From that point she went 10-2, and finished with a 1.67 goals against average (GAA). “Rachel did get things straightened out because she realized, ‘Oh, that [Taraschuk] could play,’” Rempel added..
Aside from Taraschuk, the rookies all played a big role in the team’s success this season, especially when the team was stretched thin with injuries. “Back in October we were down to, I don’t know, in Mount Royal there was getting pretty thin,” he said. Rempel singled out the play of Lauren Warkentin, who assisted on Alana Serhan’s goal in game two of the finals. “With [Warkentin], what we really needed this year was probably to take the extra step,” he said. Rempel also noted the play of Courtlyn Oswald during the playoff run as another important performance for the team. “I think Courtlyn has been an unsung hero in these playoffs,” he said. The Bisons will turn their attention to a matchup with the Queen’s University Gaels in their tournament opener. Puck drop is 3:00 p.m. at Western University in London, Ont.